To have a go at the 2018 summaries, or any other season, go to the Game Summaries page in the portfolio section of this site. 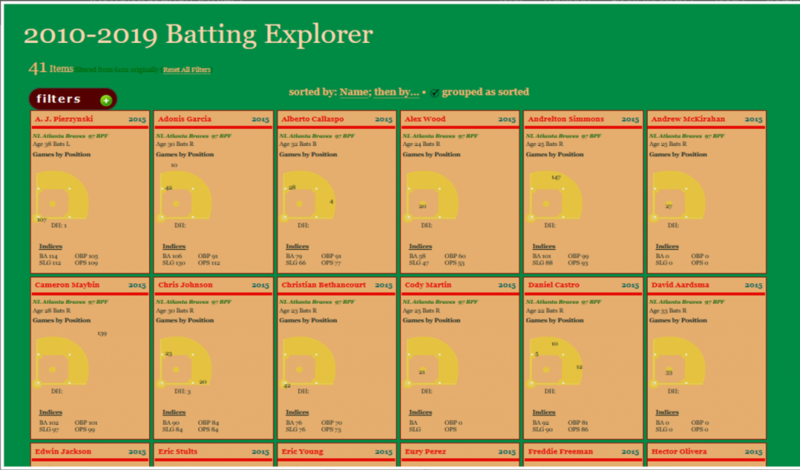 I’m happy to announce that the 2010-2019 version of the Batting Explorer has been updated with 2018 stats, courtesy of the kind folks at seanlahman.com and baseball-databank. 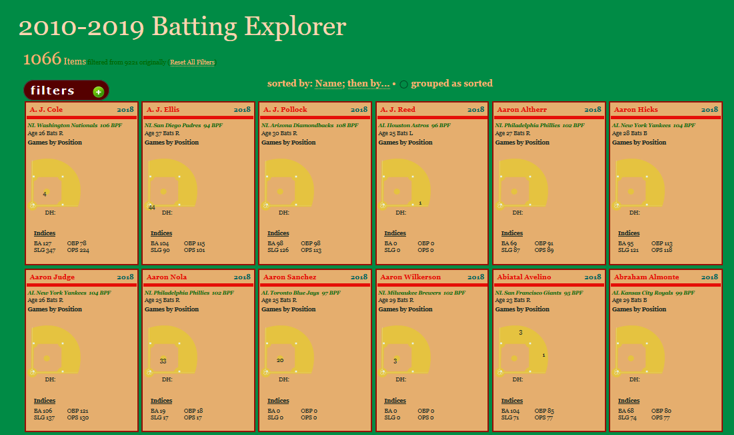 For the full roster of Batting Explorers dating back more than 100 years, click here. Enjoy! The next step is to create the 2018 version of the explorers, adding to the existing files covering the 1955-2017 seasons. I’ll keep you posted as soon as 2018 is available on the site. Thanks for reading! Updates to the Portfolio section of the VBP site continue, in an effort to reverse some lost functionality in the wake of one or more WordPress updates. The plus side of this setback is that the updates allow us to introduce a more easily maintained infrastructure with improved usability. Users can now search and scroll through content links while also accessing pages through an enhanced menu system. These enhancements should make it far easier to navigate the site and view the desired content. Once these are complete, I can begin to deliver new content; the 2018 game and season files will soon be upon us, and much of the content is itching for an update. In the meantime, enjoy what’s already here! In Part 1 of this series, we looked at how to generate node and edge data for all players within a single franchise’s history. Part 2 examined how we could take that data and create a network using Gephi, adding graph statistical measures along the way. 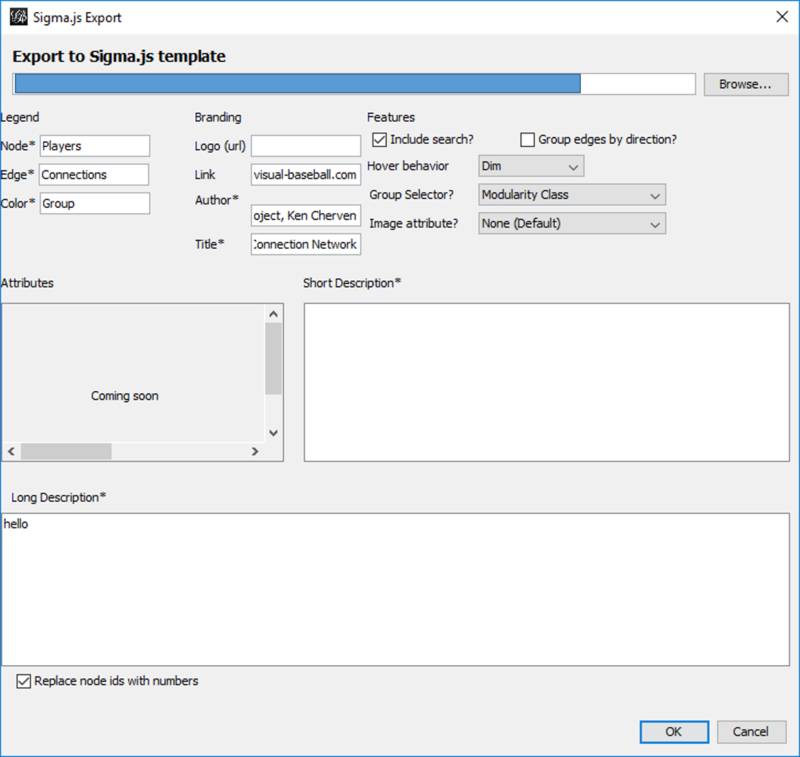 In this, the final part of the series, our focus is on moving the graph beyond Gephi and on to the web, where users can interact with the data and interrogate the player network using sigma.js software. So let’s pick up with the process of moving the network from Gephi to sigma.js. One of our goals when we export the graph to the web is to enable user interaction, so the above graph becomes a bit less intimidating. As a reminder, this is at most a moderate sized network; the need to provide interactive capabilities becomes even greater for large networks. This template allows for a modest level of customization, including network descriptions, titles, author info, and other attributes relevant to the network. When all fields are filled to your satisfaction, click on the OK button to save the template. Your network will be saved to the location specified in the blank space at the top of the template window (grayed out in this case). A word of caution is in order here – if you make some custom entries to the template, and then make adjustments to your network, be sure to specify a new location to save the generated files. Otherwise, the initial set will be overwritten. This is especially critical if you have gone behind the scenes to customize colors, fonts, and other display attributes. More on that capability in a moment. config.json contains many of the primary graph settings that can be easily edited for optimal web display. It’s quite easy to go through a trial and error process, since the file is so small. Simply make changes, then refresh your browser to see the result. Alright, now that we have had a brief view of the technical details, let’s have a look at the network graph in the browser. Note that this is still a bit experimental at this stage; I’m attempting to customize each graph based on the official team colors or close variations in the color family. 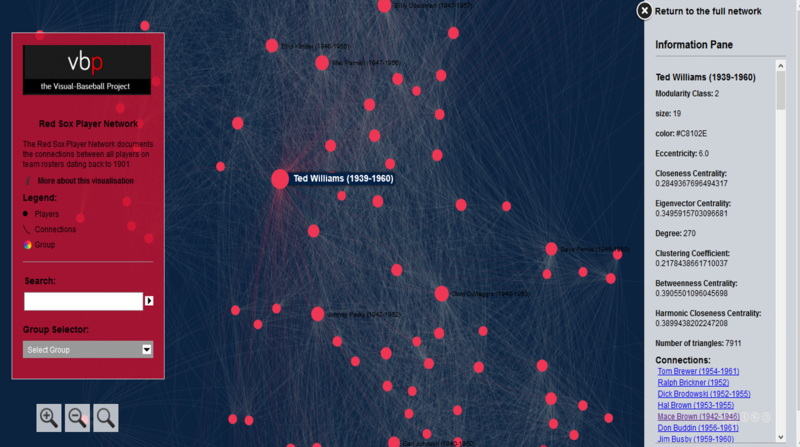 Now we see only the direct connections (a 1st degree ego network) for Ted Williams (270 degrees in this case), as well as a wealth of statistical information previously calculated in Gephi, seen in the right panel. At the bottom of the panel are hyperlinks where any one of the 270 connections may be clicked, allowing us to view their network. As you can see, sigma.js quickly provides great interactivity for graph viewers. Hovering on a node generates a pop-up title for that node, as seen for Ted Williams in this instance. We also begin to see the names of other prominent players at this zoom level. Additional zooming will reveal more player titles – a great way to embed information without making the original graph visually chaotic by displaying all titles at every level. For the current web version of this graph, click here. I’ll try to keep this version active, even if I make improvements to the final network. Once again, thanks for reading! 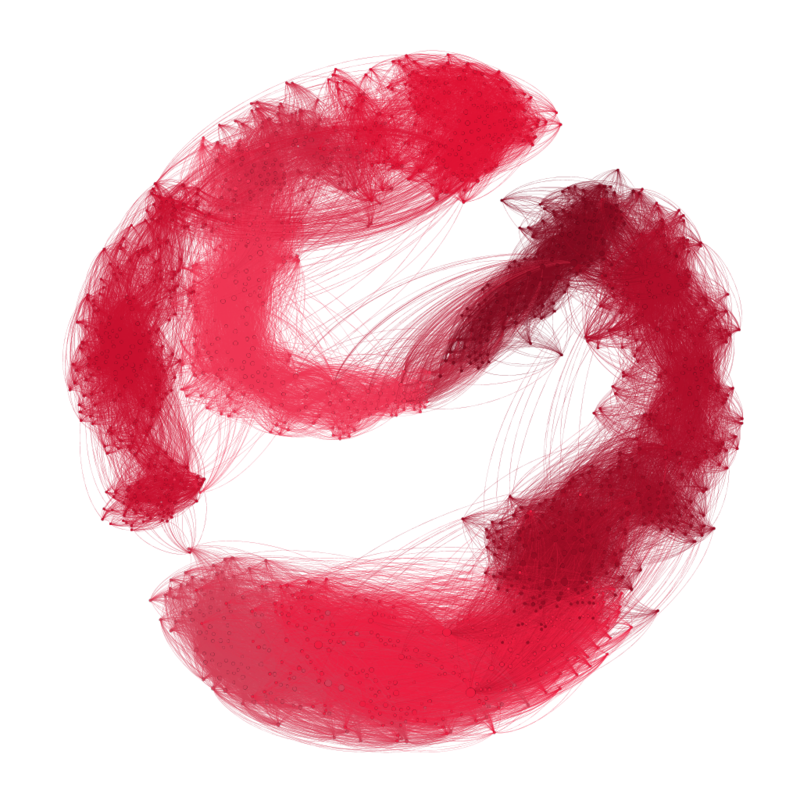 In our previous post, we looked at how to acquire and load our baseball player data into Gephi. In this second installment, the focus will be on creating a player network graph in Gephi, and customizing many settings to deliver a network graph we can export to the web. 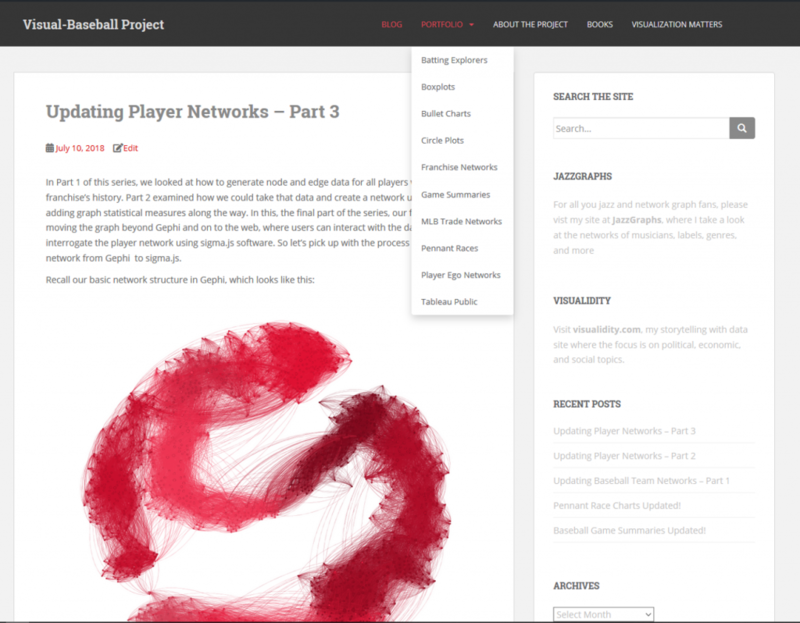 Player networks are used to detail the connections between all players who are connected to one another in some fashion. In this instance, it is based on players having played for the same team in one or more common seasons. So let’s begin with the process of creating the graph using our raw data from the first installment. 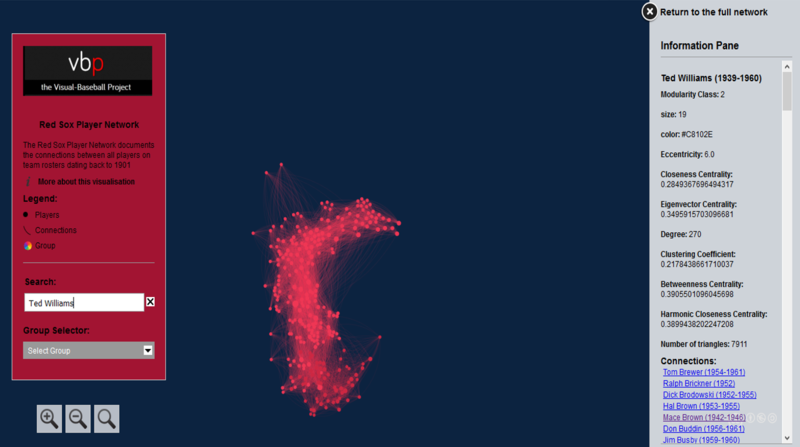 Importing .csv data into Gephi is quite simple – we create individual node and edge files (as we showed in the previous post), and use the Gephi import functions to pull the data in. I always start with the node file, since it will typically have additional information not included in the edges file. After importing the node data, I then import the edge data, which gives us the information to form our initial graph. If we were to start with the edge file, Gephi will create our node data automatically, and we will not have the detail needed for our graph. This approach may work for simple graphs, but not for our current case. How will we use color? What sort of layout will be best? Which measures should we calculate? How should we depict node sizes? In many cases, the answers to these questions come about through trial and error. We may have some ideas going into the process, but invariably, there will be modifications along the way. So be patient, and be willing to experiment as you create network graphs. The graph you will see in this post went through many of these modifications, which I won’t take the time to detail. Instead, this post will detail my final choices, along with some explanations for why these choices were made. So let’s take a walk through the various facets of the visualization. While a network will retain the same underlying structure from a statistical point of view (degrees, centrality, eccentricity, etc.) regardless of our layout choices, it is still important to select a layout that will visually represent the underlying patterns in the network. Otherwise, we could just as well deliver a spreadsheet with all of the network statistics. So layout selection is critical, and often involves an iterative process. For the baseball network graphs I built in 2014, I eventually settled on the ARF layout algorithm, which ran quickly and created an attractive circular network graph display using the player connection data. Alas, there is no ARF algorithm available for Gephi 0.9.2, so I required a different approach for the updates. Ultimately, this led to a 2-step approach using a pair of layout algorithms – OpenOrd followed by Force Atlas 2. OpenOrd is especially effective at creating a quick layout from large datasets, although with far less precision than some other force-directed approaches. Still, it is a great tool for creating a general understanding of the structure of a network very quickly. Force Atlas 2, is the near opposite of OpenOrd – a very precise approach that can be tweaked easily using the various settings in Gephi. It is ideal for putting the finishing touches on what OpenOrd started. Some of the more important things to note here are the Scaling and Gravity settings. I reduced the scaling to 0.5 so the network would display appropriately in a single window without the need for scrolling. The Gravity setting was increased to 2.5 to force nodes slightly toward the center of the display. 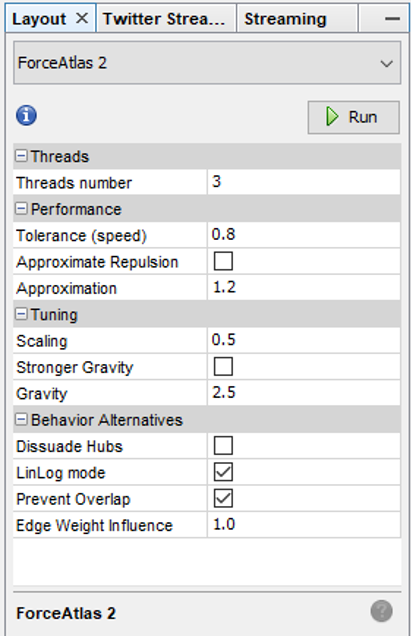 The LinLog mode and Prevent Overlap options are also selected in order to make this particular graph more visually effective. For other graphs, I have used the Dissuade Hubs option, forcing large nodes to the perimeter of the graph; in this case, that was not an ideal choice. The use of color is also important within a network graph display. Color can be used to highlight nuances in the data that distinguish one or more nodes relative to another group of nodes. Often we use color to visually represent clusters within the graph, as grouped using the modularity classes statistic or some similar input. In the case of this series of graphs (ultimately one graph per team), I made a decision to use the official team colors to differentiate each graph. Thus my initial graph for the Boston Red Sox would be based on the two primary hex colors for the current team (these colors do change over time for many teams). 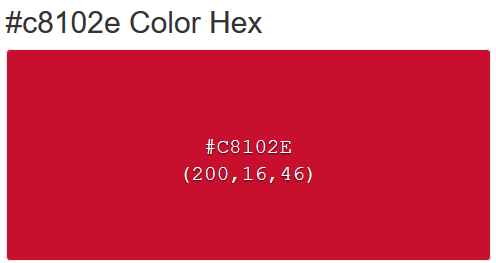 After capturing current team colors in a spreadsheet for easy reference, I used the color-hex.com site to select complementary colors for the Red Sox graph. Using complementary colors allows me to differentiate clusters in the graph while remaining true to the original concept of employing team colors for each graph. So instead of a wide range of colors one would normally see in a Gephi output, I was able to input the complementary colors for each group. Thus, one team color could be used for the graph background, while the other color (and it’s complements) could be used for the graph structure (nodes & edges). We’ll share the effect later in this post. Node sizing is another key element of effective graph design. In this case, there were a few options I could pursue for node sizing – the number of seasons played (I used this in the 2014 graphs), one of the various centrality measures we calculated, or the number of degrees (connections) an individual player possesses. After computing each of these statistics, I eventually decided to use the number of degrees as a representation of influence in the graph. Visually, I want to show how many other players a single individual is related to, and using node size is an effective means of doing so. Our final graph in Gephi is shown below; the eventual web-based version will differ slightly and include additional functionality, but that’s for another post. My third and final post in this series will address exporting this graph to the web using the sigma.js plugin, and making some additional customization to the web version. Thanks for reading, and see you soon! 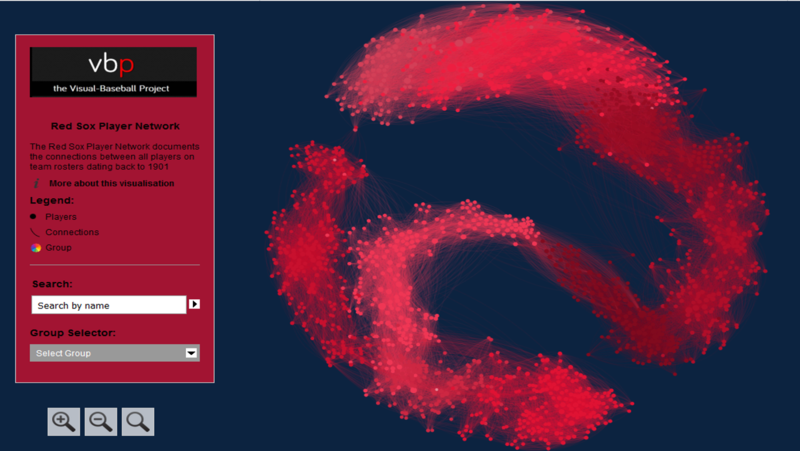 A few years back, I used Gephi and sigma.js to create a series of interactive baseball team networks, one for each current MLB franchise. These networks displayed all players through the 2013 season, going all the way back to 1901 for the original American and National League franchises. Now that we have data through the 2017 season, it’s time for an update, not only from a data perspective, but also stylistically. 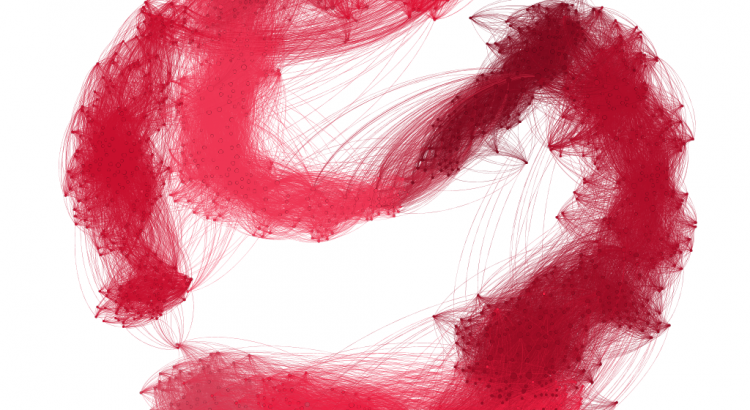 This post will walk through the process of creating one of these networks using Toad for MySQL, Gephi, and sigma.js to create web-based interactive network visualizations. Here’s a typical network from the 2013 series; the full list of networks can be found here. We’ll use the existing networks as a baseline for the new networks, although a few modifications will be made. Let’s start our discussion with the source data. 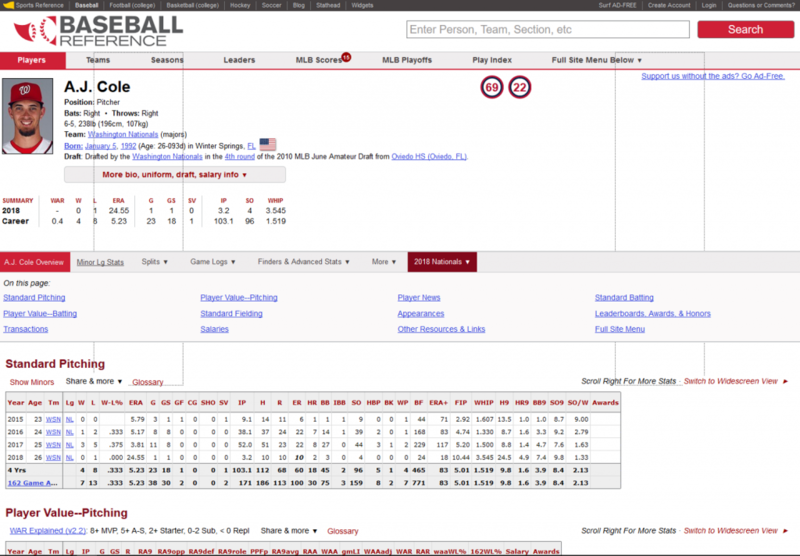 Season-level baseball data is available through the seanlahman.com website, in the form of .csv files or Microsoft Access database tables. 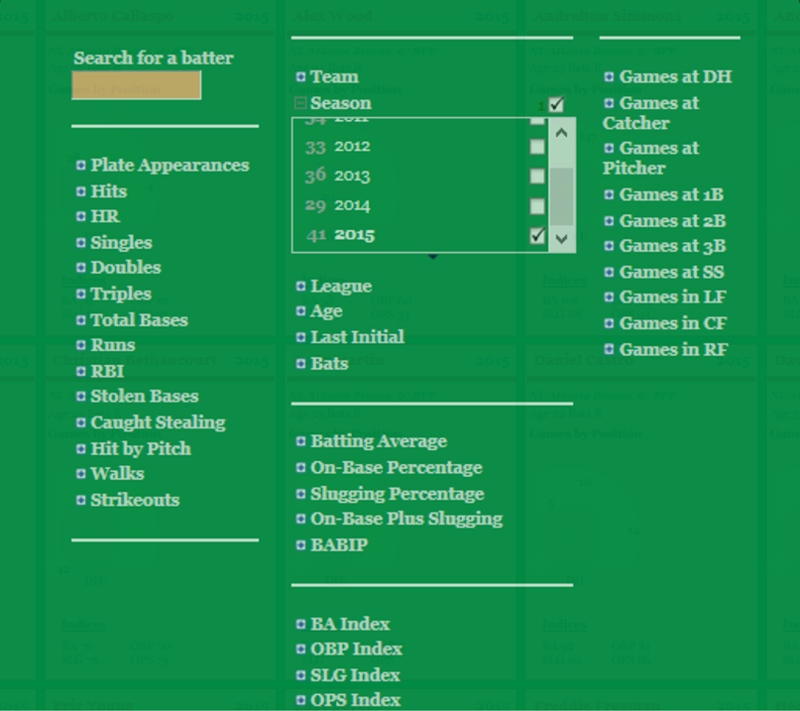 I use the .csv format, as it can be easily added to existing MySQL databases on the visual-baseball.com server. MySQL also makes it simple to add derived fields through some simple coding. These fields can be utilized later for a variety of activities. Here’s the simple interpretation – since we are attempting to display all players for a given franchise, we are executing a UNION ALL statement to combine batters and pitchers into a single result file. We have used the playerID field to create the required Id value for Gephi, while also creating a Label field by combining the player’s name with their first and last years playing for this franchise. Finally, we have created a Size field based on the number of seasons played for the franchise. We can then choose to use this in Gephi to size each node, if we so choose. Here we are matching players based on the same season and the same franchise. We then specify that we do not want to connect any player to himself, and that we want only values where the playerID value from our main query is greater than the playerID value from the sub-query. This gives us a single connection between two players, which is what we need for an undirected graph. We then define a Source node (required by Gephi) and a Target node (also required), as well as specifying ‘Undirected’ as the graph type. We leave the ID and Label values empty, and then summarize the number of seasons played together as an edge weight. 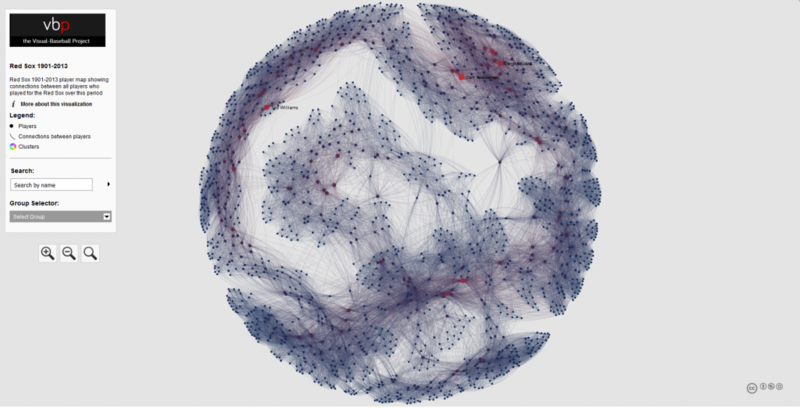 This value can be used in Gephi to show the strength of a connection between two nodes (e.g.- did they spend one season together, or 10 seasons together?). After exporting each of these files to a .csv format, we have our source data for Gephi. In Part 2 our focus will shift to creating the network in Gephi. The last of my big three annual updates is now complete, as all 2016 & 2017 pennant race charts have been created, and now reside in the Visual-Baseball Project portfolio. These charts are created using NVD3, which is built on top of the powerful d3.js framework developed by Mike Bostock. These tools help make the charts highly interactive, allowing you to see where each team stands at any given point in the season, and also providing the ability to zoom in using a smaller sub-chart beneath the primary display. The structure of the charts is based on every team’s relationship to a .500 winning percentage – a situation where a team wins exactly as many games as it loses. This structure allows for easy interpretation of the results, as we can see which teams hover near the .500 mark (i.e.- consistent mediocrity), others that rise well above this level, and also those teams that descend far below the breakeven point. Allow me to illustrate these thoughts using the 2017 American League Central division, and my hometown Detroit Tigers, who suffered through their worst season since 2003. 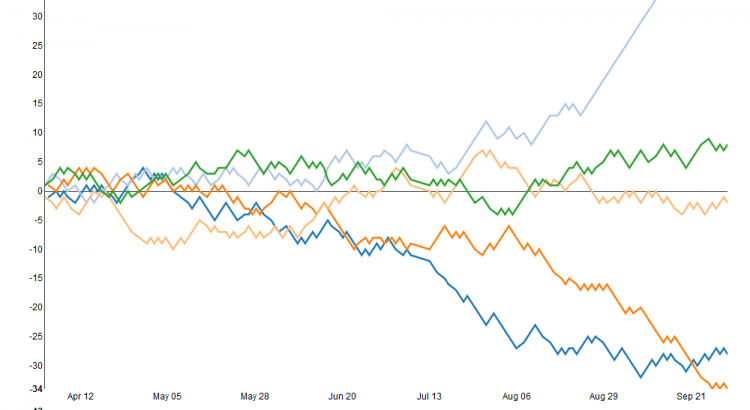 As you can see, the darker orange line representing the Tigers takes a steep dive starting in early August, culminating in a final record 34 games below the .500 percentage. Meanwhile, the rival Cleveland Indians (light blue line) present a near mirror image of the Tigers failure, with a sensational month of September that ultimately lands then 42 games over the .500 break-even level. Similar charts have been created for the other divisions for both the 2016 & 2017 seasons. 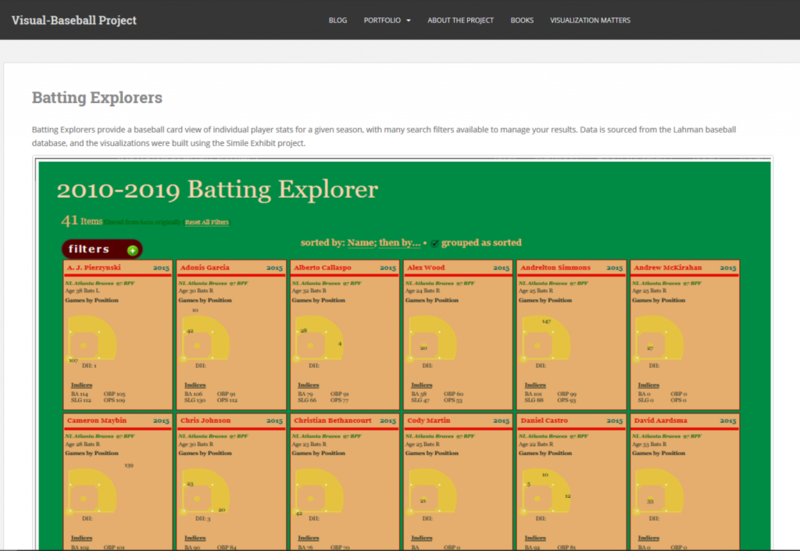 In fact, you can now view any season, league, and divisional splits dating back to the 1901 campaigns, a total of 380 pennant races to explore! 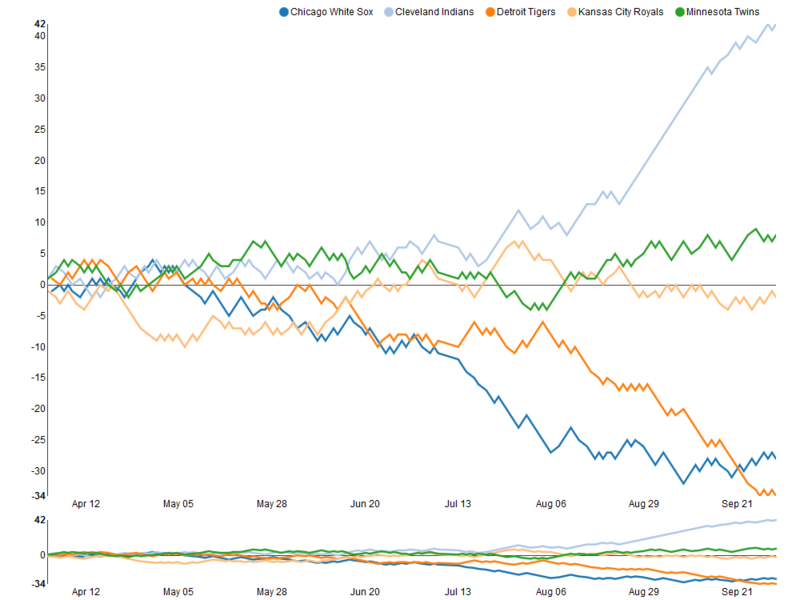 Find all the pennant race charts here. Have fun exploring, and as always, thanks again for reading! Thanks to some unusually cold and rainy weather, I’ve been able to focus on updating both my source databases as well as some of the visualizations built from the data. That’s a roundabout way of saying that the baseball Game Summary exhibits have been updated for both the 2016 & 2017 seasons. They can be found in the portfolio section of the site by following this link. 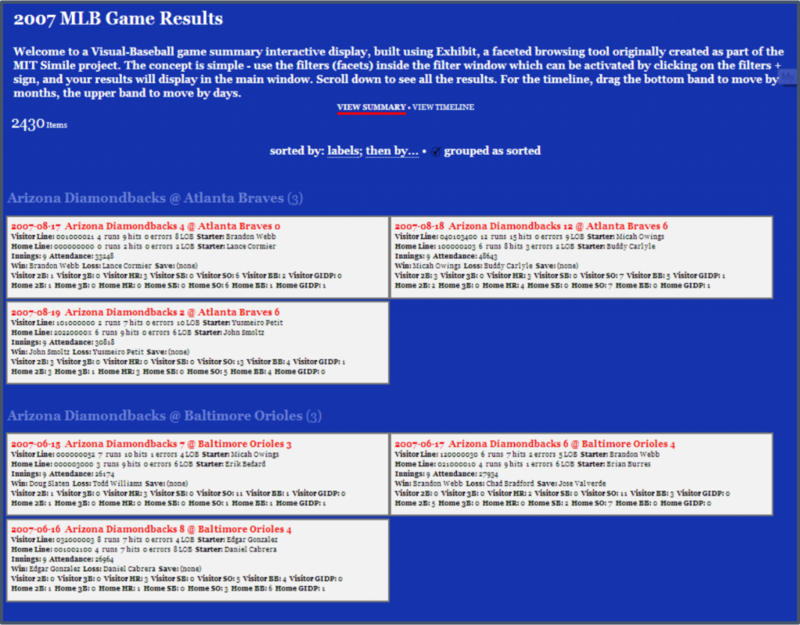 As a refresher, the baseball game summaries give you a sort of visual box score for every game played in a season, featuring the line score for the game, winning and losing pitchers, attendance, and much more information pertaining to each specific game. The real power comes from the ability to filter results to find all games that match specific criteria. As you can see, there are many available filter options, right down to who the home plate umpire is for every game. Here’s a quick illustration of how the filters can be used. We’ll filter 2017 results where Clayton Kershaw was the starting pitcher at home, and gave up 4 home runs (a very rare event!). 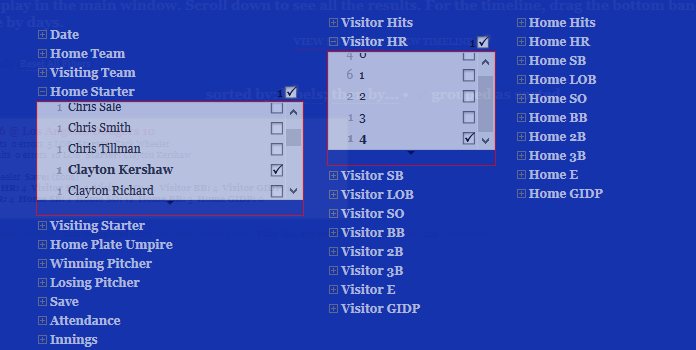 First, we select Kershaw as the Home Starter, and then we open the Visitor HR filter, and select 4 (there’s just one instance). We can then apply these filters to see at which game this unusual event took place. Ironically, we can see that the Dodgers not only won this game, with Kershaw as the winning pitcher, but that they too hit 4 home runs (Home HR in the box score). We can also see that the Mets struck out 13 times (Visitor SO) and the Dodgers 12 times (Home SO). Must have been a wild day at Dodger Stadium on June 19th for the 43,266 in attendance! As you can see, a lot of information can be gleaned using just a couple of selections to filter the data. There are nearly endless possibilities for using the filters to return the information that most interests you. So have a look at the game summaries and any other items in the portfolio section. Enjoy, and thanks for reading! This project uses the Exhibit project software originally developed years ago as part of the MIT Simile project, as well as a lot of HTML & CSS for styling purposes. Give it a try, and thanks for reading. Visit visualidity.com, my storytelling with data site where the focus is on political, economic, and social topics.